Alexandria Ocasio-Cortez dealt a stunning defeat to Democratic Party incumbent Joseph Crowley in the primaries for New York’s 14th Congressional district, which spans across minority-majority areas of East Bronx and North-West Queens. She ran on an “unapologetically progressive” platform, as she described it, which included demands deeply important for working-class people. The call to “abolish ICE” stood out among them and became particularly poignant in the wake of a national scandal following Trump’s atrocious immigration policies. Her advocacy for Medicare-for-All, housing as a human right, and a federal jobs guarantee places her squarely on the left of the Democratic Party’s political spectrum. She defeated an incumbent who is decisively at the core of the Democratic Party establishment (he’s the Chairman of the Democratic caucus), and a friend of Wall Street. A 28-year old Latina from the Bronx who until recently worked as a waitress and bartender, she embodies the living reality of thousands of working people of color in her district. She has repeatedly stress, however, that she does not seek to represent them only from an identitarian point of view, but also through their demands. 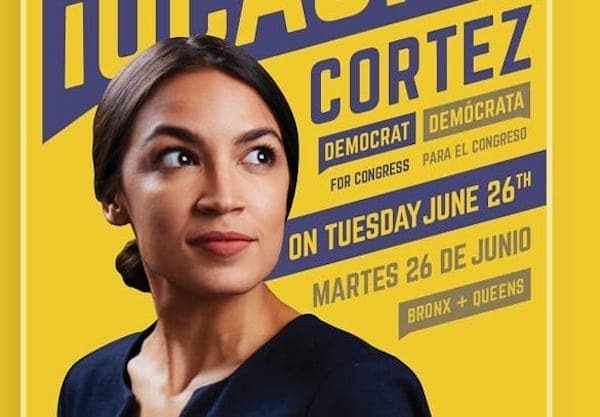 Despite the progressive character of her platform, the AFL-CIO and a dozen unions in New York–including the UFT, SEIU, the building trades and TWU local 100–sided with establishment-candidate Joseph Crowley. All major newspapers reflected the political earthquake inside the Democratic Party and New York Times columnists called her a “political star.” Although also a product of smart campaigning and the weakness of her opponent, her victory shows that self-identified socialists can win elections; that grassroots candidates funded by individual donors rather than big capitalists can upset establishment politicians with working-class demands. Those demands are worth fighting for, and socialists should organize at their workplaces and mobilize in the streets for specific goals such as abolishing ICE (and full rights to all immigrants regardless of their legal status), tuition-free college and student debt cancellation, or Medicare for All (even though what we really need is free universal health care). We should organize and fight for these demands, even if it is a Democrat who champions them in Congress. Winning these battles would place the working class on better footing to advance in organization, strength and political consciousness. However, the ends cannot be disconnected from the means. Ocasio’s win in the Democratic primary—and her wide-open path to the House—fosters the expectation that these reforms can be achieved by electing progressives into Congress. Her impromptu victory speech, genuine and encouraging as it was, remained fully within the framework of electing good people into Congress and using institutional structures to channel our politics. Instead, the primary task, is to rally people for these goals, build a network of activists and organizers who could mobilize hundreds of thousands for Medicare for All or housing rights. We can elect a few dozen progressives to the House, but the remaining 435 representatives will vote down any such initiative unless there is enough popular mobilization as to pose a threat to the government. Real political change requires mass mobilizations. History is filled with examples that prove this. It took the wave of sit-down strikes in the 1930s to get the Wagner Act and the Social Security Act passed. It took the Black Power uprising in the 1960s to finally break the back of Jim Crow. In contrast, the low level of mobilization and labor unrest in the past four decades (the causes of which are beyond the scope of this article) allowed for the rollback of working-class rights, stagnation of wages, and ramped-up commodification of public services which characterized the neoliberal era. The recent wave of teachers’ strikes may be a harbinger of a badly-needed change on this terrain. But even when class struggle is on the rise, the wrong approach can lead to disastrous outcomes. The example of Syriza in Greece is illustrative in this regard. Support for Syriza skyrocketed between 2012 and 2014. Riding on a wave of popular protests, occupations and a few general strikes, the ‘radical-left’ coalition took office in 2015 with the promise of ending the austerity policies imposed by the EU. Once in government, Syriza’s national leaders turned their backs on their supporters and signed agreements with the “Troika” (after a referendum vote overwhelmingly rejected them), leading to austerity measures that were even more egregious than those imposed before. The experience with Syriza is so powerful because it shows that not even attaining a plurality in parliament (something about which progressive democrats and democratic socialists dream) can secure, by itself, meaningful reforms if it’s not a reflection of a mass movement outside congress. Furthermore, by channelling the mass movement to a parliamentary strategy, it showed the ultimate failure of reformism and the need for a politics of rupture with the capitalist state. Many of us on the far left insist on the need to maintain working-class independence. The DSA (the largest socialist organization in the U.S.) has not taken so far an official position in this regard, but has in effect endorsed a growing list of candidates running on the Democratic Party ballot. However, a section of the DSA membership is uncomfortable with this approach and would favor a more clean political delimitation vis-a-vis the Democratic Party. It is well-known that Alexia Ocasio-Cortez is a DSA member, and she counted not only on the endorsement but also on the active support of her organization, which dedicated countless hours to phone-banking and door-knocking for her. Although some DSA members have high expectations in the Democratic Party, it seems that the majority only conceive of these races as a way to “use” the Democratic Party ballot line to advance socialist ideas (and progressive policies), and to circumvent the heavily stacked electoral system until the time when the DSA grows strong enough to run their own candidates. The question is whether the DSA is using the Democratic Party or vice versa. In other words, is the DSA profiting off of the (maybe naive) openness of the Democratic Party to left-wing activists/candidates, or is the DSA providing a left veneer to the democratic party and, in effect, catalyzing its renewal? Moving forward, Ocasio will face great pressure from establishment democrats to moderate her discourse in order for the Democratic Party as a whole to appeal to more conservative constituencies come November. There are already voices in the liberal mainstream media that warn against the risk Ocasio’s win poses to the Democratic Party – that it will allow the party to be portrayed (by Republicans) as having moved too far to the left, thus jeopardizing their chances of taking back the House in November. How will she respond to these pressures? To whom will she be accountable when deciding which demands to push uncompromisingly and which ones to table for the time being? It seems unlikely that the DSA will have any influence on these decisions since her campaign was largely planned and run by Justice Democrats and Brand New Congress. In addition, the DSA lacks a structure to oversee and guide the candidates it endorses and campaigns for. Therefore, the hopes for Ocasio’s success once she is elected rely entirely on trusting her, as an individual, to be able to navigate the extreme pressures inherent in holding (and keeping) office in the U.S. Congress. More tellingly, Ocasio has already made statements that identify herself as a loyal member of the Democratic Party. Even if the rest of the DSA sees her as only “using” the Democratic Party ballot line, she has been open about her impressions of the party (or lack thereof). In an NPR interview the day after she won the primary, she said that she “ [looks] forward to us [the Democratic Party] having new leadership just in general,” but refused to criticize Nancy Pelosi when prompted by the interviewer. Then, in answer to a question about party leadership, she answered: “I think it’d be inappropriate to commit to any one individual before we’ve even won back the House in November. Let’s make sure that we do that, and then we can have that conversation.” Speaking as part of the Democratic Party and not ready to question its leadership, her rhetoric is more akin to that of Bernie Sanders and the Brand New Congress than that of an independent candidate. There is a clear effort by different organizations to renew the Democratic Party. Given its calamitous state, the progressive wing has concrete chances of winning some leverage within the party structure and moving its agenda—even if slightly—to the left. It is widely acknowledged that the Democratic Party’s odds to resurrect from the ashes hinge on its capacity to incorporate these newer and younger, more progressive candidates. The party is poised to do so just as they have done so many times in the past: from outliers like socialist fiction writer Upton Sinclair in 1934 to prominent political activists like Jesse Jackson in the 1980s, the Democratic Party machine has repeatedly absorbed, pilloried and digested radical political activists and the movements behind them. When the DSA devotes efforts and resources to Democratic Party candidates, it is effectively breathing new life into a party controlled by capital. Furthermore, we should never forget that this is a party that has consistently supported military interventions all over the world and is responsible for the deaths of hundreds of thousands in imperialist wars, state terrorism, and drone attacks. At the same time, it is precisely the Democrats’ utter failure to defeat Trump and the quagmire which followed that opened the possibility for the DSA to multiply its membership in the span of two years. In other words, it was the awareness that the Democrats are not an alternative for socialists and working-class people that encouraged thousands to join the DSA. Now the DSA is helping rebuild the Democratic Party. After Ocasio’s win, the DSA membership numbers reportedly spiked again, adding over a thousand dues-paying members. The question is where to funnel the energies of this new generation of political activists who are embracing socialist ideas because they see that capitalism has nothing to offer. There is an unsettled political dispute over the destiny of the organization and the relationship with the Democratic Party. The resolution of this debate can either help hone a new layer of anti-capitalist activists or lead them to the guts of the Democratic Party, and ultimately, to dismay and frustration. The renewal of the Democratic Party is taking place, spearheaded by Bernie Sanders and the many organizations that stemmed from his campaign. Socialists can choose to take part in this process or to dedicate our energy and resources to supporting working-class struggles, organizing for working-class demands, and building independent working-class campaigns to reinforce those struggles. The latter is urgently needed, the former is a safe path to failure.